You want to know what the brain salon program really is and how it is all set to help you get bursts of creativity, improve your moods and happiness, bring a good night undisturbed sleep, get you complete relaxation and get you sharp focus. Right? 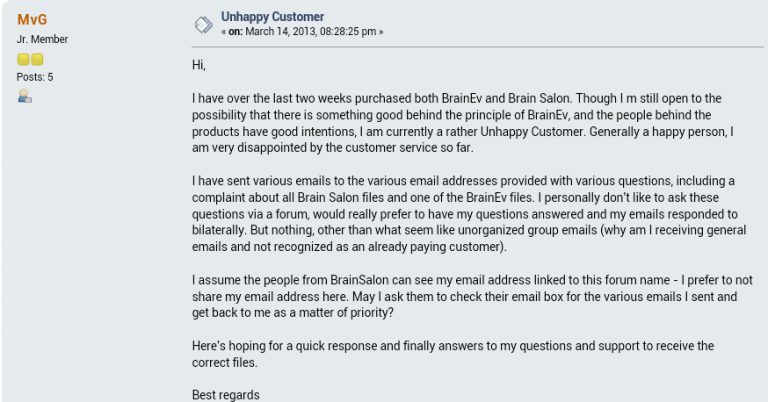 Well, my short brain salon review will help you have a deep understanding of it and help you make an informed decision. If you have any questions about this program or any aspect of it, please leave them below and I’ll get them answered soon as I see them. Okay? What is the Brain Salon program? This is brain music program that uses brain entrainment technique to help you get your mind to withdraw from the different states you may be in, like disappointment, anger, sadness and such, to heightened states that you love like happiness and good moods, peacefulness and calmness as well as focus and concentration, among others. 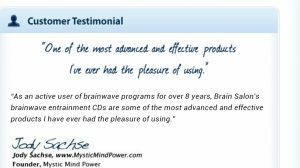 Brain entrainment is the use of scientifically based music involving waves with frequencies that influence the waves in your brain, that indicate the state of your mind, which help to achieve the state of mind you want to have. It is more like hitting one rod with another vibrating rod, both rods will start vibrating. This is the science behind it, and it works pretty well as it is pure and has no side effects as with brain boosting supplements. It was made by Joe and Craig, who are part of the inspire 3 company that deals with high end brain entrainment programs. I love these guys because they know exactly what people want. I have personally tried out brainev, one of their concentration training programs and it worked pretty great for me. There are 6 CDs in this mp3 series with each specifically designed to help you achieve a specific state of mind. This means that with this program, you can get your mind in 6 different states whenever you want. It takes about 30 minutes or less to start feeling the effects and what you only need to do is slip in your headphones and just wait for the “magic” to happen. Here are the 6 CD’s with the 6 Different States. 1. Power Chill – This helps you to be calm and collected, boost your moods and gives you energy to tackle the tasks before you. Here, your mind is exposed to one frequency for a short while and then is alternated after 30 seconds. And then for deeper effects, the process is done in reverse. It will help you get strength when you feel like you are falling apart at work, when you want to work on something at home and you feel tired, or when you simply want to be cool and relaxed. The good thing about this is that you can listen to it with your eyes open, you don’t necessarily need headphones and you can do looping. 2. Creative Spark – This is the CD that helps you with creativity. It will help your mind become inspired to think in a special creative way, outside the box and will help with problem solving. They say it gives you genius and breaks the normal thinking pattern that your mind is used to. It then gets it to form new thinking patterns that will help you see beyond your limited capacity and be extremely creative. Here, you also don’t need to use headphones, you can loop and also keep your eyes open if you want. 3. UltraDeep Sleep – I should call this the pathway to slumber, it gently walks you to “napland” as well as help you sleep peacefully. If you are having trouble falling asleep, you just need to listen to this and you will be swimming in slumber land in minutes. With this, earphones are not necessary, and you also shouldn’t loop. Moreover, you should keep your eyes closed. If you are in distress and uneasy, it would be best if you listened to powerChill first, 30 minutes before you start using this one. 4. HighEnergyEspresso – This is the “morning caffeine for your ears”. When you wake up and want to have deep mental stimulation as well as plenty of energy to prepare for the day’s tasks, it is going to help you get into ‘the feeling’ real quick. If you are lazy and don’t feel like you want to do anything, this will get you a surge of energy and make you want to work. Just listen through it in the morning, immediately after you’ve woken up, preferably outside where there is cold so that ypou don’t doze off, and you will see a difference within minutes, and through the day too. You dont need earphones, also, you can listen with your eyes open or closed, but you shouldn’t loop. 5. Happy Pill – This is what you need when you need to get in the ” happy social” mood or during the weekends, when you want to get a bit wild. It will help with the release of the happiness hormone, serotonin, and will keep you feeling great, bright and shining, and very ‘loose’ with so much openness towards others. It is going to help drop your worries and get enough energy to have fun. It is something you want to start your fun days with, but be sure not to listen to it late in the evenings as it will interfere with your sleep. You don’t need earphones or looping with this. You can also keep eyes open or closed as you listen. You can listen through it without earphones but you’ll get deeper effect with them. You should keep your eyes open but you can close them for seconds after every few minutes to help you relax. • Complete Brain Salon User Manual – This is a PDF manual that helps you get your way around in the system. It will give you a quick introduction, explain things deeply but in the fewest words possible, along with other stuff you’ll want to know. • Lifetime Support – You get a free lifetime support, after you buy the program, with support specialists on the other end waiting to answers any questions with easy practical solutions. • 100% Money Back Guarantee – You get 60 days guarantee that promises you a full refund policy in case you are not happy with the program. 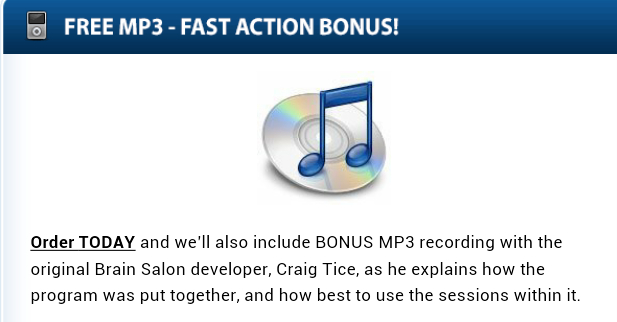 You are told that if you buy today, you will get a special mp3 audio recording made by Craig Tice, one of the major developers, giving explanation of how best to utilize it and how everything was made. The support team is also friendly and prompt. I saw a complaining customer in the forum, and I was happy with the way the issue was handled by one of the support guys. Here is an excerpt of the complaint. Well, you are going to find many other places claiming to sell this program, and they will say many things to convince you to buy from them. Please don’t fall for them. Buy the Real Brain Salon Here. You also get a free demo you can download and listen to, to help you know what exactly you are getting. With the trial, you will see how effective it is. I have seen folks asking about the discounts and coupon codes, and I have to say that I haven’t really seen any genuine ones so far, so be wary of those sites and people who promise them. In case of any changes, I will communicate here. That is all about the Brain Salon brain entrainment program. Again, if you got questions any questions, I’m right here with answers. Shoot then below and I’ll be more than happy to help you out. These days with all the stress and distractions in life finding a way to reenergize one’s brain is a big plus. It will give you an edge over your competition too. So many people today are also depressed and i feel this would be of great value to those people, as it has been personally for me. Thanks for the information on this product. I also confirm it works great! And yes, people who are oftenly stressed and those that get easily depressed should try it out. It really does give the mental edge that most of us are subconsciously looking for. I have noticed quite a few of these products on the market, but it is always difficult to see how effective they are as there are not too many reviews like this. Has this program helped you with your concentration? Spending countless hours studying I often find it difficult to maintain focus, and also make the switch into a relaxed social state. Do you think a program like this would help with that? There are very few products like this in the market indeed. I think it’s because the brain is something special with its own unique power, that is understood by very few people, who are among the few that are willing to push their research to the ultimate extreme to understand how it works, perfectly. Most people just create standard products and push them on people. But after using them, they come to realize that its not any good for them. And that makes the people who produce it to be avoided and end up shutting the companies down after getting barely any sales or better yet, get banned due to low quality products. I guess a review from someone who has actually tried them out and seen for themselves that it works is what helps. Don’t you think? About focusing, this product will help you concentrate, I have seen that myself because it alters your brain waves and get you completely relaxed and attentive. But personally, I prefer using brainev because it trains your mind to concentrate and within 7 months, you are really great at it. If you use it wisely, there are many benefits to take out of it. Finally, on using these products to study and then being able to be social with people. When you study using them, it will be a great experience for your study. And when you are done studying, your mind naturally flips to the social side, and you forget you were really attentive with your studies (except for keeping what you have learnt well stored in your memory). I think if you have problems with making the switch, you can try talking to your mind. After studying, try saying things like, “I’m done with books! It’s time to get social!” Or things related to that. And make sure you say it audibly, it acts as a command to your brain and helps you switch much faster. That is the power your tongue has over your mind. I like your open mindedness. It is true that telling someone something will work in a way will often believe and use it to achieve what you told them they would get. And most likely, they will see the results. But the problem is, not all things often work that way. I think it’s one thing to get promised that a product will work and it’s entirely another to witness it working, specifically for you. I have had many cases in the past where I was promised that something will work great for me, put my faith in the product but turned out to be completely terrible that I didn’t ever trust the one who told me to use it. I guess putting the product to the test and seeing for yourself if it works is the best way to believe it actually works and to confirm that what you were told is true. To be brief, you can use the various music styles, as you say, and it may work for you, but not for someone else because how your brains operate is different, based on many factors. But if you are looking for something that will work for everyone, especially with the different states of the mind, using brain technology, brain salon is your sure thing. I like this. The products you review look very good. I think I will return to look in more detail. Being healthy and keeping our brains elevated is the way forward. I totally agree with you, people sometimes pay too much attention to what happens the neck down when they should focus on the neck up. Are you doing any other brain boosting techniques? Other than brain entrainment. Hey Mike, yes I do. See, things like brain salon are just there to help show you that your brain is capable of great things and able to be in any state when you want it. So I do something I like to call meditation, but it is not really such. It helps you kind of overcome the things in your life you feel you are conflicting with, and wouldn’t want to allow them to keep holding you back. And from there, you seek to perfect the virtues you acquire from this practice. I also have to agree that it is a bit pricey, but the value you will be getting off of it is more than the money spend on it. I guess it is as they say, expensive is cheap while cheap is very expensive. See, you bought a brainwave entrainment program that you may have felt was cheap and affordable but you now find brain salon far much better than that. I have also done that. That is the nature of us humans. We want the best at the cheapest price possible, but most people who produce the best are not willing to deliver at that low cost, keeping in mind the effort they put into the creation of the actual product. I guess we all have to accept that quality things that will truly help us come with a hefty tag as they are set to help us satisfy our desires completely than to just get excited for a while and then break down. About the experience with the product, this thing is really mind blowing! It was like it was build by people who wanted to solve problems they were facing themselves. I say this because it is accurate and delivers its best, if you follow what they recommend you use and how you should use it. In simple terms, it works as great as they describe it! Do you have an affiliate program I could link my web-site to? I am really sorry for the long delays. You can get the links for Brain salon. Use this link to sign up to the affiliate program. I am actually using Zen12 and I’d like to know if I can use Brain Salon at the same time (I have not read the user manual yet because I couldn’t download it). Please I hope you can help. thanks in advance. Well, it is okay to use brain salon together with zen 12. But I would recommend having a good time period between the use of the two systems. By this, I mean you first use one of the systems like zen 12 and then give yourself a few hours (preferably more than 4 hours) before using the other one, brain salon. That strategy should work well for you. If you need more help, keep this discussion going. It will be a pleasure to help.